I am excited about the curious ESL teachers who want to begin connecting with a little bit of guidance. And so I’m trying, with the help of TESL Ontario webinars, to share my experiences and inspire others. One of the reasons I began to explore Twitter was to find an alternative to the constant negativity I was encountering in my profession. There isn’t enough time, there aren’t enough materials, students don’t pay attention, there is too much marking, I can’t get through to these students, the students are constantly on their cell phones…the list is exhaustive. The solutions to all of these problems are found on Twitter. Flip your classroom to give yourself more time to connect with students when you see them. Engage students through technology so that they are using their mobile devices together with you, not against you. Explore 21st century classroom ideas for alternatives to assessment and to learn more about project-based learning. There are no problems on Twitter, just challenges to complete. Another reason I joined Twitter was to find more support in a profession that is all about connecting with students, but which also isolates the professional from her colleagues. Teaching is a lonely game, ESL especially. Not many of us have schedules that allow us to connect with colleagues over coffee or between classes. Some of us work in centres where there isn’t even a designated space for meeting. 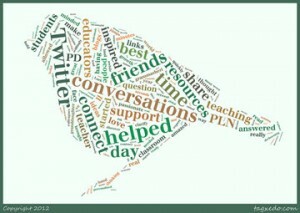 Twitter is my virtual staff room, my 24-hour PLN Support Desk. The first webinar I hosted for TESL Ontario was the mortar and bricks to explain Twitter and take participants through the process of setting up an account. 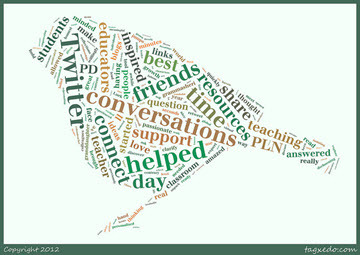 The second webinar showed teachers how to develop PD and PLNs on Twitter. Both are in the archive on Tutela.ca in the TESL Ontario group, under Files, and accessible anytime. I will host the final webinar in the series on November 22, about how to use Twitter with students, specifically geared for the ESL classroom teacher. I’ll answer every question you have if you answer just one of mine: why aren’t you on Twitter yet, my future PLN? My thanks to my TESL Ontario Webinar tweeps: @jenartan, @mydezkho, @Francine_Bee, Magdalene Shin, Leena Kirmani, @capontedehanna for their constant support and feedback. Burgess, D. (2012). Teach like a pirate: Increase student engagement, boost creativity, and transform your life as an educator. San Diego, CA: Dave Burgess Consulting.